Rosdarrig B&B – Rosdarrig is a modern home offering Bed and Breakfast, genuine Irish hospitality and quality accommodation. Rosdarrig House is a four-star Fáilte Ireland approved luxurious Bed and Breakfast offering genuine Irish Hospitality. Rosdarrig is located beside Boyle Abbey and Lough Key Forest Park and is only a five minute drive from 2 Golf Courses. It is an ideal base from which to tour the West and Northwest and is only 40 minutes from Ireland West international Airport. Sligo is only a 25 minute drive and Carrick-on-Shannon a 10 minute drive away. Rosdarrig offers scenic views of the Curlieu Hills and of cattle grazing the surrounding Farmland, yet is only a few minutes walk to the local Restaurants and Pubs. All guests are greeted on arrival with Tea/Coffee along with Brenda’s Home Baking. Complimentary Tea /Coffee plus Home Baking on arrival. 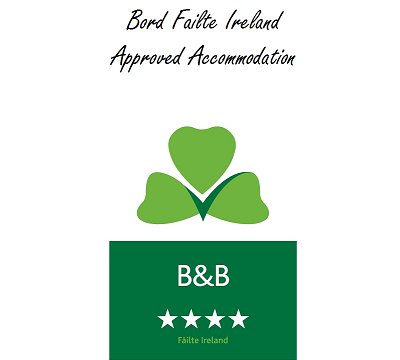 Ideal base for Four Star Luxury accommodation Failte Ireland Approved. Touring the West and Northwest. Walking distance to local Restaurants and Pubs. Comfortable large Beds with luxury Toiletries, Mineral Water and Luggage racks in all Bedrooms. Family Rooms and Ground Floor rooms available. Close to Kilronan Castle and Cromleach Lodge Hotels. 40 minutes from Knock International Airport, 2 hours from Dublin Airport. 25 minute drive to Sligo and 10 minute drive to Carrick-on-Shannon. Late Breakfast available on request. B&B Ireland & Farmhouse Vouchers available. Easily accessible to Boyle town’s various restaurants & pubs.